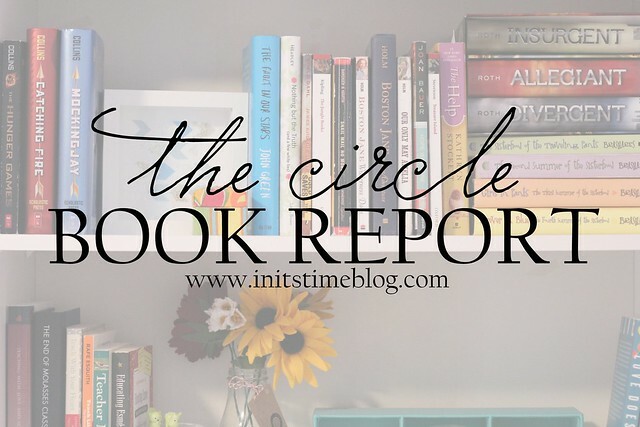 THE CIRCLE OCTOBER 2014: BOOK REPORT. Happy October, friends! We're almost through with this month and it's hard to believe that come this time next month, I'll likely be talking about Thanksgiving and Christmas. So just think of all the fun we'll have with The Circle then! I’m an English major turned work-from-home editor, mom to a sweet redheaded little man, and wife to a doctor-in-training who is finally in his fifth and final year of residency. In all my spare time, I’m an amateur blogger and runner and an accomplished restaurant explorer, guacamole maker, and mix & match suitcase packer. In Residence chronicles various and sundry things I enjoy doing, wearing, reading and making, ventures out & about in our current city and other travels, and most importantly: making the most of life, no matter what stage we're in. 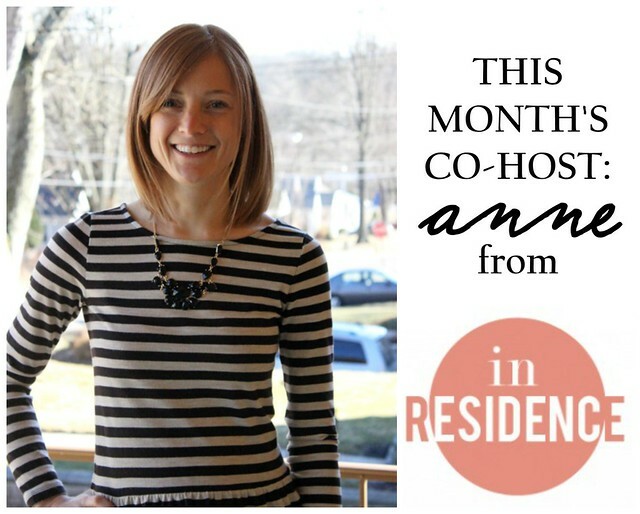 Anne isn't just a blogging friend, but an inspiration, too. Her organization skills, her personal style, her Currently link-up, and her home tour are just a few of the things I admire most about her. And how could you not fall in love with her adorable son and fun Pin to Present posts, too? FAVORITE BOOK(S) OF THE YEAR? There are so many! I feel like I've read a lot of books and yet at the same time, there are so many I haven't finished yet. But for this year, I'll say my favorite book is probably Quiet: The Power of Introverts by Susan Cain. It's one of those reads that really affirmed my introversion and reminded me that I'm not the only introvert out there and that being an introvert is well, just plain awesome. I really wanted this to be the book that I just finished, but sadly, it's the book that I'm reading right now. Which actually isn't really that sad, seeing as I'm really enjoying it. But I digress. The book I just started and am currently LOVING is Bread and Wine by Shauna Niequist. WHAT BOOK DID YOU JUST FINISH? I wasn't sure how literal to take this question, but the last book that I read was actually to my class of preschoolers. I'm sure by now you know my love for Robert Munsch's work, and so I chose to read his book, We Share Everything! It's such a cute book on the power of words and how kids' and adults' interpretations can be so very, very different. So many books! I just shared the books that I bought for my newest project, but the book I have next to read on my shelf is Introverts in the Church and Grace for the Good Girl. FAVORITE BOOK(S) AS A KID? I had tons of favorite books as a kid. In my opinion, you can never go wrong with Junie B. Jones, Amelia Bedelia, and Nancy Drew, too. But my very favorite book series in elementary school was the Amelia series by Marissa Moss. The series is written in a diary or notebook format and the illustrations and characters are priceless. WHAT BOOK WOULD YOU TAKE ON A DESERTED ISLAND? I'm pretty sure I'd take the Bible with me. It's honestly one of the few books out there that I can actually read and re-read and not only enjoy, but actually learn from it, too. Often times, I'll read a book and then keep it on my shelf. But the Bible not only teaches me, but it's a book I can turn to, too. So what are YOU reading right now? What are your go-to reads, the books that you're constantly recommending to friends and family? Write your post (or share in the comments! ), grab a button, and link-up with us and see what everyone else is reading below! And if you're social media savvy, feel free to use the hashtag #thecirclelinkup and grab this button, too! Next month's theme is all about sharing our top 5-10 essentials. It's pretty open to interpretation because I know that each blogger has his/her own favorite things. So share your Fall essentials, your work essentials, you style essentials, or just your favorite life essentials. Make it your own and link-up with us on Wednesday, November 19th. See you then! Ahh, book posts are my favorite! I spent so many days of my youth pouring over those pages (and features in the American Girl Magazine) and copying her illustrations. Amelia was my hero. Also, Introverts in the Church? That sounds right up my alley. 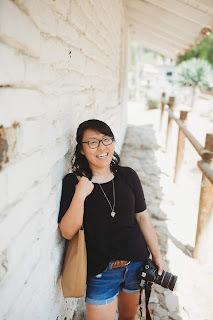 This was such a fun post to write, and I love getting book recommendations from other bloggers! 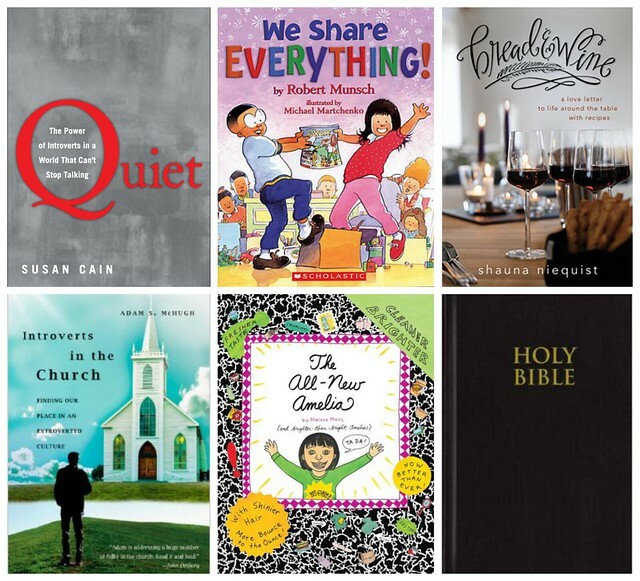 I've heard good things about both Bread and Wine and Quiet--both are on my to-read list. I'm currently reading Grace for the Good Girl. Liking it so far! Also, I love next month's topic! I love books. I'm reading The Knowledge of the Holy. Ooo... I'm putting Quiet on my list!! I love this idea! I'll have to see if I can get my thoughts together and join in. I adore reading! Thanks for hosting such a great link-up, Kiki! p.s. thanks for the sweet intro! So fun to be hosting this with you. I LOVED the Amelia books. They were so much fun! I always thought her struggle to spell "weird" was weird. I think I would take the entire Harry Potter series with me to a deserted island. Well, if you are going to count school books, the last thing I read would be "The Hungry Caterpillar." You mentioned some great books...I really need to read Bread & Wine! As for the Amelia series, I always wanted to read them! My library didn't have them and the school library did, but they weren't ever a high enough reading level so I wasn't "allowed" to read them during the school year. :( I do own the books about Samantha, Felicity, and another American Girl that I can't think of right now and I devoured those every summer for several years! I have been meaning to read Quiet for so long. I have heard such amazing things about it! DO IT!!! It is quite honestly one of the best books I've read in a long time. It was such a cool thing to read and just be affirmed that introverts are just as good as extroverts and that there are others out there like me. And I got that email but haven't had a chance to read it yet. I'll definitely let you know, though, because I am super intrigued!! Doesn't that book just sound fascinating? Meg (from Me with the Three) recommended it to me and I cannot wait to dive into it! Oh, and those books are both AMAZING. You'll have to let me know if/when you get a chance to read them!! And Quiet is so fascinating. I never would have thought to read it to get a better picture of a loved one/family member/spouse, but I could definitely see how that could help. Did Jordan ever read it? And I got your email about reading Grace for the Good Girl. I cannot wait to read it now!! Yay, I'm glad you loved it Delia! I try to brainstorm topics with my co-hosts that not only describe and interest the co-host but also a wide variety of bloggers, too. I can't wait to read your post! And I loved both of those series growing up. There's something to be said about humor in books that makes reading more fun! :) And how could I forget Judy Blume? LOVED her books, too! Those books were REALLY fun. I loved them growing up! And thanks for co-hosting with me! It was so much fun and I can't wait to read everyone's posts! And you should definitely read Bread and Wine. I, for one, was a little unsure about that one because it is more food-centered but I've found it's seriously amazing. Have you read Shauna's other books? Yes, I am an introvert! I never even really considered myself one until the last couple years. I always love learning more about my personality type. The Circle is a complete success! I have heard everyone talk about Shauna for the longest time. I've clicked over to her blog occasionally. But I really knew nothing about her! This fall, someone was talking about her (I'm thinking it was Meg) and I asked all my questions...I read (most of) Cold Tangerines this last month and really enjoyed it! I loved her style! Since that one was basically a collection of essays, I would pick it up snd read whichever ones I wanted to (not in order). It was her spot in the magazine that made me want to check out her books! I loved that Magazine! Jordan didn't read it, but I basically told him everything I was reading as I was reading it, so it pretty much read it! haha. I had my post scheduled to post earlier but I have been a hot mess this month with standardized testing and a field trip. Thanks for hosting! Oh man, standardized testing AND a field trip? You rock, girl! What grade do you teach?